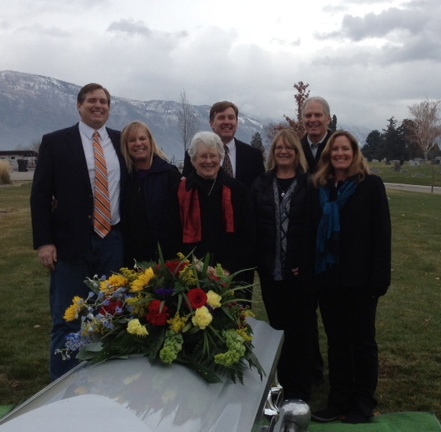 Yesterday we reburied Dad’s bones, brought from Farmington, New Mexico to American Fork, Utah. As opposed to the funeral, this was a happy occasion with Mom and all my living siblings. Jeff (Gainesville, Florida), Carol (Delores, Colorado), Mom (American Fork, Utah), Paul (Bend, Oregon), Jill (Jerome, Idaho), I (Woodland Hills, Utah), and Christy (Salt Lake City). John is buried just up the hill from this. We walked up and stood around his grave telling stories about our brother, as we had about our father. This entry was posted in Uncategorized and tagged Abbott family. Bookmark the permalink. In the family photo , I recognize no one, including you! And I think I met most of the family at least once. well, that’s us. for better and worse.